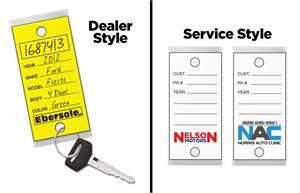 Versa-Tag Custom Logo Key Tags are still the best - and can now be printed with your custom logo! Color imprint designs are available on white key tags only, but black imprint designs are possible on any of our standard Versa-Tag colors (Yellow, White, Red, Blue, Green, Tan, Gray, Orange, or Lilac). Each box contains 250 tags and key rings. Please send your artwork (in vector format) to art@paa.org.